I began this project with the simple romantic notion of how powerful the paradox between city and agriculture can be. Rounding a corner in the Roxbury neighborhood of Boston, to find the one acre farm run by The Food Project literally inserted into the existing urban fabric, was my first encounter with the visual and intellectual impact of this particular adjacency. 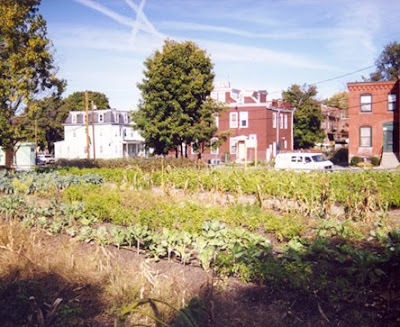 I knew that many educational and non-profit projects related to urban agriculture existed and wondered if the concept might be expanded to include productive market farms. I knew also that many urban areas suffered from a lack of open space while farmers were priced out of the same areas by high land prices. Somewhere on the continuum between nostalgia and speculative futures seemed to be a fertile middle ground in which answers to these dilemmas might be harvested. But as I began to research our current food system, I realized that actually the stakes are quite a bit higher, that the seemingly steady food supply is built on shaky ground – both ecological and social. So let me begin here. What’s wrong with the food system we already have? In some ways nothing is wrong - that is, food and food products are widely available to most of the population and starvation due solely to lack of food availability is not a social issue we face. Yet in most ways, many things are wrong. For one, conventional farms are very big. In 2007 the average farm was 449 acres, or 0.7 square miles. 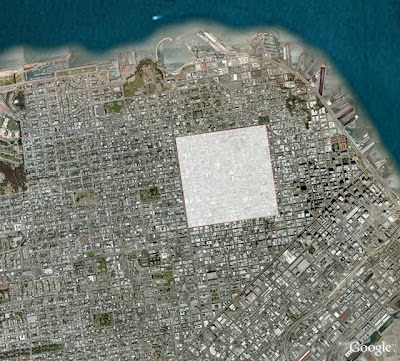 Large farms must, by fact of their size, be located far from urban centers. Their size also means that one farmer, or a crew of farmers, must employ heavy equipment and multiple chemical inputs in order to manage the planting, growing and harvesting. Further their size suggests an economy of scales in which monocultures of a single crop (wheat, corn, soy) are grown for distant markets. These factors combined suggest farms that are highly dependant on petroleum based inputs (fertilizers, herbicides, pesticides, gasoline) to grown their crops and transport them to market. Any interruption in the supply of oil would wreak havoc on these farmers’ ability to feed their markets. Conventional farms are also very far away from the people they serve. It is oft quoted that the average item of food travels 1,500 miles from farm to fork. The environmental and food security implications are obvious. Just as troubling is the disconnect that people can begin to have with their food and its sources. In 2006 the average supermarket carried 45,000 items, a truly astonishing figure which suggests the potential for 'supermarket ennui' in shoppers. Amongst all the packaging and refrigeration, it becomes hard to make a connection between these products and the natural process that created any of them. In order to value our farmlands and farmers we must first know they exist. Children who believe food comes from the store will not understand why it is important that farmland be preserved; much less believe that food production is not a process owned solely by the food service industries, but rather an act that any of us can perform.